Now Bingo Review | Get Your £30 Welcome Bonus Here! Play at Now Bingo today and you will instantly receive 7 days of completely free bingo! No deposit is needed to take part in these games, simply register an account, verify your details and away you go. The fun doesn’t stop there, you will also be treated to a 550% bonus package, comprising of a 300% first deposit bonus, a 150% second deposit bonus and a 100% third deposit bonus. You will be hard pressed to find a top bingo brand that offers more value than that! The 7 days of no deposit bingo sign-up bonus is available to all new players. To get your free cards, you do however need to verify your credit card details. This is done to stop fraud and ensure only one person per household claims the freebie. Once you have registered an account, you will be free to claim up to 12 free tickets for each game in the Newbie Room for an entire week. You will able to withdraw your winnings after making your first deposit and meeting the 4x wagering requirements on bingo. A new player bonus package keeps the value going over your first 3 deposits. You will receive a 300% first deposit bonus, meaning if you deposit just £10, you will get £30 extra and a total of £40 to play with. There are further follow-up bonuses of 150% and 100% respectively. 7 days of no deposit bingo on registration. Deposit £10, play £40 welcome offer. PJP jackpot prizes of up to £2500. £6,000 in sliding jackpots every night. Play 1p games for £5 prizes. All players are treated equally at Now Bingo and there are no coupon codes to be had. That being said, from time to time the site does run a number of competitions or provides giveaways on social media. You might want to check out their Facebook page for more details. Now Bingo works perfectly from your smartphone or tablet. 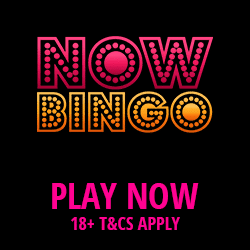 No app download is required, all you need to do is head over to www.nowbingo.com from your mobile device and you will automatically be forwarded with the correct version suitable for you. If you have any Android or IOS device the mobile version will work for you. Thanks to their top-notch Cozy Games software, you will be able to play all your favourite bingo and slots on the go. The sheer choice of games is something to be admired at this top bingo site. You will be able to play everything from new variations such as 30 and 50 ball speed bingo to classic games such as 80 and 90 ball bingo. When it comes to ticket prices, there are games for every budget here. Bingo cards start from as little as a penny each and go up to 25p for the £3k Payday Jackpot. If slots are your thing, you will be catered for here, since this is one of the leading sites on the Live Bingo Network, you will find well-known titles such as Fluffy Favourites, Irish Luck, Honey Bees and more. It’s not just slots, casino lovers will enjoy the different table games and scratch cards. Why not indulge in a cheeky game of blackjack or roulette, whatever you fancy, you can do so here! Real money games starting from 1p. Cannot withdraw winnings until you make a deposit. There are 4x wagering requirements on bingo. Minimum deposit is £10, minimum withdrawal is £1. UK Gambling Commision License Number: 38719. There are few reasons not to give Now Bingo a bash! With 7 days of free bingo given away on registration, there is no risk associated with signing up and claiming your new player freebie. Other perks also include the lucrative welcome package, high-speed bingo games, big jackpots, great selection of slots and promotions that are updated every month.